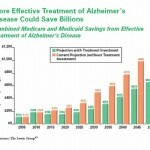 According to the Pharmaceutical Research and Manufacturers of America, one of the most promising medicines in development is to treat Alzheimer's disease. The medicine inhibits plaque formation and blocks the degradation of the neurotransmitter acetylcholine. According to the Pharmaceutical Research and Manufacturers of America, one of the most promising medicines in development is to treat Alzheimer’s disease. The medicine inhibits plaque formation and blocks the degradation of the neurotransmitter acetylcholine.